Even though we immigrated to Canada when I was very young, I still have memories of eating fresh picked figs from the trees outside our home. I had never appreciated what a luxury that was until I grew up and realized just how much I love figs and how difficult it is to come by tasty figs in Canada. They’re anything but local and flown in from thousands of miles away, definitely not the same as devouring them fresh off the tree. Here in Italy, the best figs come from the region of Puglia in southern Italy, and these days they can be found in markets across the country. 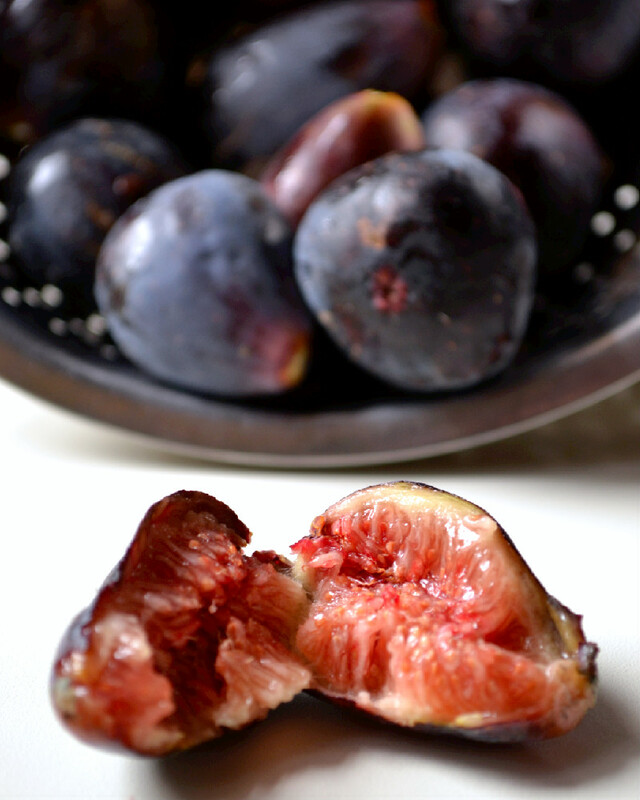 Figs, along with all early autumn produce are referred to as “Settembrini”, meaning “of September”. I got my hands on a container on these beautiful settembrini fruits at the market last Saturday and got through about half of it by eating them straight out of the fridge after a quick rinse, skin and all. The purple skin is smooth and tender, and the pink flesh is deliciously sweet and honey like and the seeds hardly noticeable. 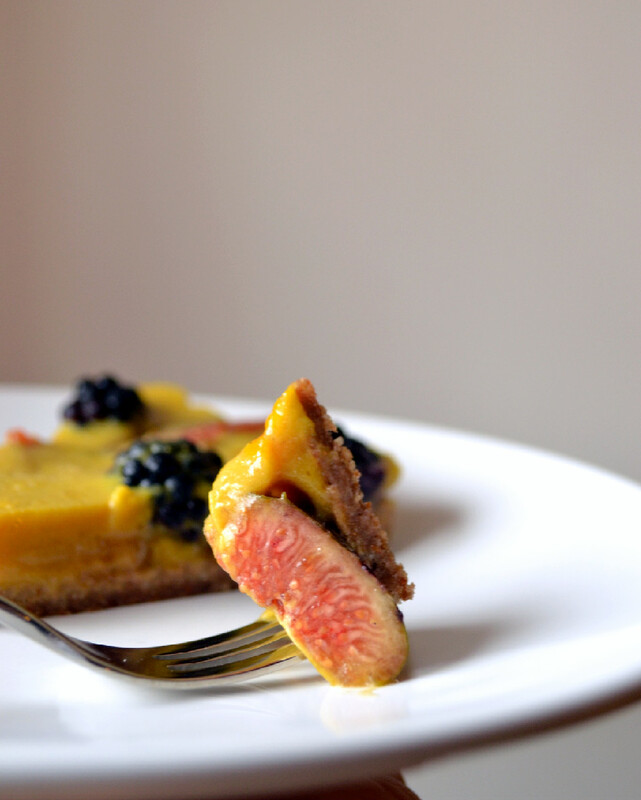 I decided to use the rest of the figs (setting two aside for good measure) in this Saffron Custard Tart along with blackberries, another Settembrino. Saffron is an aromatic spice that adds a decisive flavour and a vibrant yellow colour to this vegan eggless custard. A blend of rice milk and coconut milk give it a light richness, while the vanilla bean and orange blossom water add flavour, freshness and more wonderful aroma. The custard is also refined sugar free, lightly sweetened with barley malt, thickened with kuzu root powder and set with agar agar, making it the healthiest custard around. Kuzu and agar agar have powerful healing properties and can be used for many preparations. Kuzu is a plant based thickener that is helpful for many symptoms including headaches, hangovers, and digestive troubles. Agar agar, a gelatinous substance derived from alga, boasts its own health benefits. It’s is loaded with calcium, iron and fiber, aids in digestion, reduces inflammation, calms the liver, and helps rid the body of toxic waste. The custard is set, among the figs and blackberries, in a rustic thin crust, made with buckwheat, nuts and dried Turkish figs and bound by the goodness of a chia egg. The dried figs add sweetness and their seeds add a nice little crunch with every bite. If you’re looking for a light dessert for a Sunday brunch that celebrates the best of the season, you can now have your tart and eat it too. 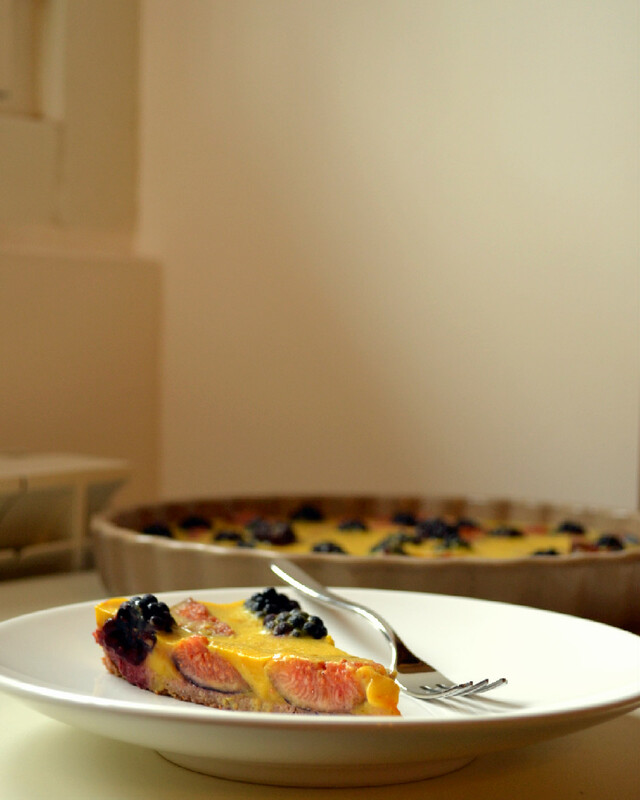 This tart celebrates the best of September in Italy with fresh Apulian purple honey figs and tart blackberries nestled in a creamy and aromatic saffron custard that is set in a rustic dried fig, nut and buckwheat crust. Vegan, gluten free and refined sugar free with a nut free option. A perfect dessert for a Sunday brunch. Transfer mixture into greased tart pan and press it firmly into the bottom and slightly up the slides. Use a mini pastry roller to flatten and even it out. Poke several wholes in the base of the tart with a fork. Bake in a preheated oven for 10-12min. Remove from oven and set aside to cool. Once cooled, line the crust with figs and blackberries and set aside (see assembly instructions below). Slice vanilla bean pod vertically and scrape out the seeds. Add seeds and pod to the pot with the milk, stir to combine and let the vanilla infuse the milk for about 5 minutes on medium-low heat. Add sweetener, orange blossom water and diluted kuzu and stir frequently over medium heat until slightly thickened (it should be a thick liquid, like a heavy cream at this point, but not like a custard yet, as it will set once cooled), boil for an additional 1-2 minutes and remove from heat. Slice fresh figs into quarters and place cut side up onto the crust. 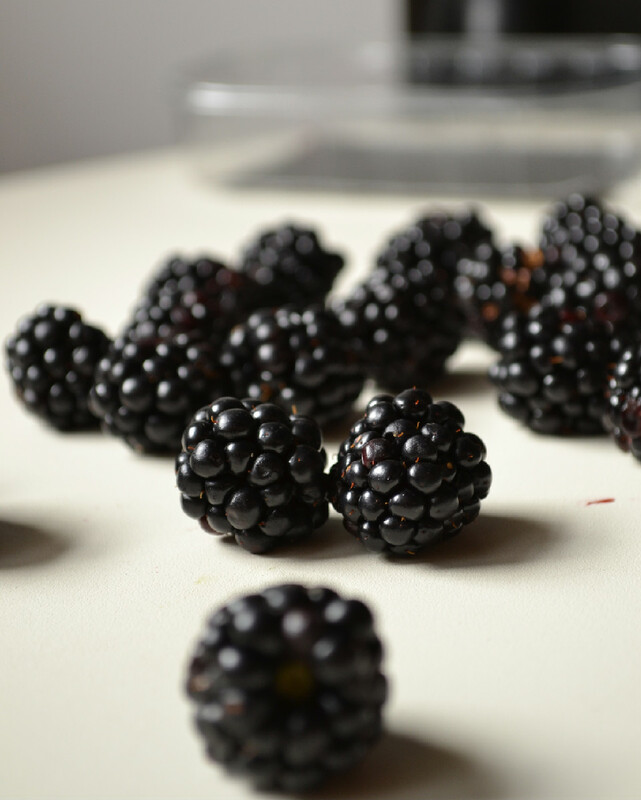 Add fresh blackberries. You will want to complete this step before preparing the custard. Prepare Custard. 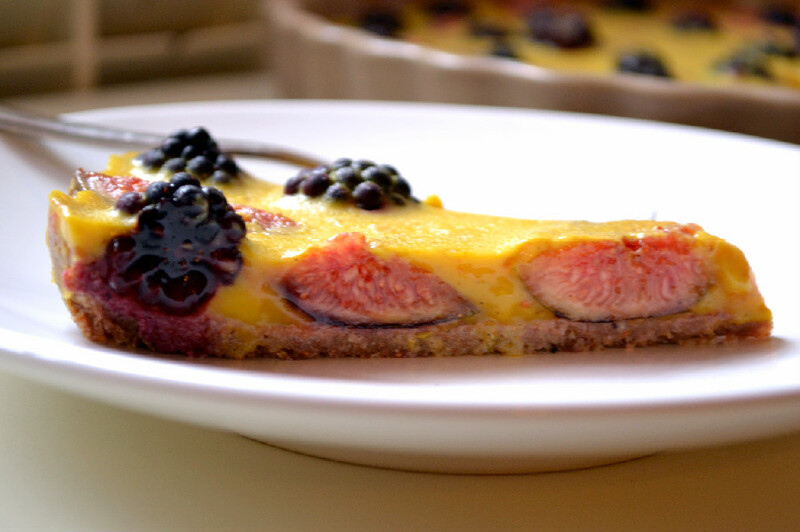 Remove from heat and pour into the crust, filling the crevices between the figs and balckberries. Let cool for about 20 minutes and then refrigerate to set for at least 1 hour or overnight. I used 2 tablespoons of barley malt, but if you like things sweeter you can use up to 4 tablespoons. Barley malt adds a caramel like sweetness and a rich colour to the custard. You can substitute it with brown rice syrup, agave or maple syrup, but the colour, flavour and level of sweetness will change so be sure to adjust to your taste. This dessert looks divine! And to know its pretty healthy too, even better! Thank you! It was pretty good, the saffron really adds a special touch and I just can’t get enough figs.